We are committed to helping students to learn English language more efficiently, effectively and with confidence. We take care to assess students’ use of functional English at the beginning and end of each camp. There is growing evidence to support our belief that English is learnt more effectively within a fully structured environment. We create just such a setting, where students are fully immersed in the English language across classroom lessons, coaching sessions and recreational activities with our pastoral care staff. We support the ‘total immersion’ concept of language learning on our residential English language and sports camps. Our English language teachers and sports coaches work closely together to ensure that the English and sports sessions complement each other. This is reinforced by a pastoral care team that understand and contribute to our language learning objectives. The language taught in the classroom enables the students to gain more from their coaching and community living experience, ensuring that they build their language skills in a relevant and meaningful way. 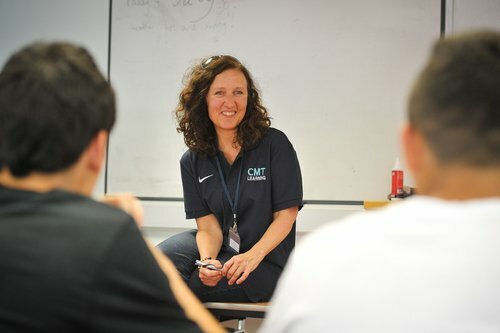 Our staff includes full time educationalists who understand the limitations on the amount of time teenage students can concentrate on a single classroom subject. Learning a foreign language can and should be enjoyable. We design our English teaching to be engaging, stimulating and fun, with plenty of activities and games relevant to the students’ interests. Each student leaves us with a written report indicating strengths and areas for improvement and a personalised plan for further progress. Students spend the morning in the classroom learning English, and the afternoon being coached in their chosen sport (or vice versa). Suitable for all ages and language abilities, this course gives students an opportunity to improve their core language skills, grammar, spoken and written communication. Our dedicated and highly qualified English teachers deliver a custom made curriculum based on the successful CLIL model used in top schools across the world. Teachers use active participation and sports relevant project work alongside traditional classroom-based learning to keep students fully engaged. All students leave the camp with their English workbook, a proficiency certificate and an individual assessment with advice on how to further develop their language skills. All our teachers have a post-graduate teaching qualification and are usually full time educationalists. Our teachers often live at the camp with the students, coaches and pastoral care team and get involved in all aspects of camp life. This cultivates the fun and immersive community atmosphere that makes our summer camps such a fantastic experience for students. Teachers get involved in recreational activities, sports and are even around to supervise during free time. All our teachers undertake continuing professional development during their work with us and are peer-reviewed and supervised during their teaching delivery. Each camp has a Director of Studies, a senior teacher qualified to manage the curriculum and responsible for maintaining the high standards we demand from our teaching delivery. The Director of Studies will analyse all test results and sign-off students’ end-of-camp reports. They are always available to deal with any issues in the classroom and answer questions from parents about the curriculum before, during and after the camps.